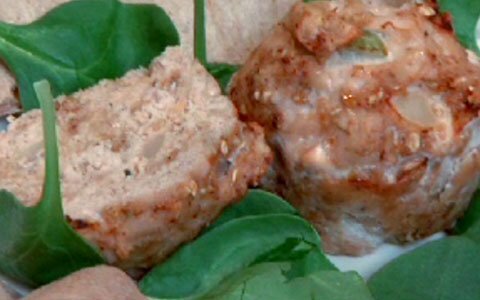 I decided to try and make the awesome Turkey Meatloaf Muffins, found on BodyBuilding.com. Basically, they kind of look like glorified rissols (if you are Australian) so right away they appealed to me. I didn't have all the spices listed above, but I did the best I could and mixed it up a little bit. I added some curry powder and more garlic along with some cayenne pepper. This is quite possibly one of the grossest sensations you can experience. Mixing minced meat with your hands. Remember to take your watch and rings off because it gets everywhere.. The recipe calls for two pounds of meat but I only had one so I halved everything and hoped for the best.